Chronicle Books, 2017. 224 pages. A history of the card catalog – it’s surprising how interesting that turns out to be. Well, okay, it’s interesting to me! 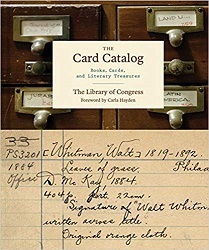 This book traces the development of the idea to put catalog information for libraries on 3 x 5 inch index cards. Originally, the Library of Congress would publish a book listing the books in its collection. So listing the information on cards was much more practical. Eventually, the Library of Congress was producing catalog cards for libraries across America. But that’s only a small portion of this book. The bulk of the pages are pictures of items in the Library of Congress collection – along with pictures of their catalog cards. There are many classic books, also interesting memorabilia – and on the facing page you’ve got the catalog card – some of them yellowed and beat up – for that item. This is a beautifully designed book and is lots of fun to browse through. Because it’s mostly pictures, it doesn’t take too long, either. Black Dog & Leventhal Publishers, 2017. 234 pages. It’s no surprise I love this book. It contains photos of hundreds of librarians, with short quotations from them about their jobs. There are essays about the importance of libraries. Essays by famous writers about their experiences with libraries and other essays featuring notable libraries and the good work they are doing. 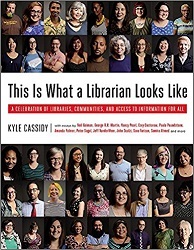 In short, the subtitle says it well – this is a celebration of librarians and libraries and the vast depth of resources they bring to their communities. I hope that non-librarians will look at this book and gain a new appreciation of all that modern librarians do. I already know all this! In fact, non-librarian friends and family, please read this book as a favor to me. You’ll understand all the better why I am so proud to be a librarian and see librarianship as my calling. And yes, I have several friends featured in these pages – well, they are at least acquaintances and people I have worked with on committees. I’ve spoken and worked with them. Even had lunch with a few at conferences. But besides that, this is a beautiful look at the wide variety of missions of librarians and libraries in American communities today. How can I help libraries? That’s a question I never really thought about until recently. But now it’s something constantly on my mind, because libraries can use some help, and very often the people in the best position to do so are those of us who haven’t thought about them for a long time. If you travel across America talking about libraries, you will meet some people who love them, some who are indifferent, and others who think they are a waste of resources. The functions that libraries serve are bound up with their communities; indeed, the two are symbiotic. The more love you put in, the more you will get out. There’s so much work being done in every community across the country by these people. This isn’t a book about America’s most significant libraries; it’s a book about everyday libraries doing everyday work. They’re just drops of rain in a thunderstorm, but together they work to make the ground fertile. Wherever you are in America, there is a librarian fighting to get you something, whether it’s a computer, an audio book, a children’s book, a banned book, job skills, a citizenship test, a record deal, a movie to watch, a fishing rod, answers about thirteenth-century clothing, voter registration, local archives, a place to stay warm or cool or dry, a kayak on a breezy summer afternoon, or any of a thousand thousand other things. These librarians are fighting against incredible odds and against powerful forces and against ignorance and arrogance. They don’t even know you, but they’re getting up every morning, relentlessly building a colossus for you to stand on to see farther, reach higher, and achieve more. They’re fighting for your right to access information. How can you help libraries? What are you waiting for? Check this book out from your local library! If you need help finding it, I know someone who’d be glad to help. I’m on the 2019 Newbery Committee!!! My name’s Sondra Eklund. I’m Youth Services Manager at City of Fairfax Regional Library, and I was recently elected to the 2019 Newbery Award Committee, and I’m so excited! I’ll be reading as many books as I possibly can that are published in 2018 in the United States by American authors for children ages 0 to 14. At the start of 2019, I will meet with 14 other people in a locked room, and we will choose the winner of the John Newbery Medal – for the most distinguished contribution to American children’s literature published in 2018. We will also decide if we want to name any Honor books which are also distinguished. Committee deliberations are top secret, and I can never reveal what goes on in the room where it happens. During the reading year, I can talk about which books I like, but I cannot write about any eligible books online, and I must never give any indication of what books the committee is considering. After the award has been announced, I can post reviews of books I enjoyed if I wrote the reviews before any committee discussion happened. But above all, I can give my opinion, but never “the committee’s” opinion – except in the announcement of the winners. Now, as you can imagine, there are many, many children’s books published in America in any given year. This is where library customers and staff can help. I’m going to read as many books as I can, and other committee members will read as widely as they can. There is a nomination process during the year, so committee members will formally nominate, from our reading, which books we will consider in the final deliberations. But just in case some good books get overlooked, if you or your children read an especially good children’s book published in 2018, I hope you’ll let me know! Our first job as committee members is to read as widely as possible, and you can help tip me off if there’s a book out there you want to be sure gets read. I hope to visit some local schools and talk about how the process works and get the kids on the lookout for good books as well. How did I get on the Newbery committee? I became a librarian as my second career. (I used to teach college math, but then got to work in a base library in Germany and fell in love with libraries.) But I have always loved books and especially children’s books. I began writing Sonderbooks.com, a website of book reviews, in 2001. As I was getting my Master’s in Library Science, in 2007, the ALA Annual Conference came to Washington, DC. 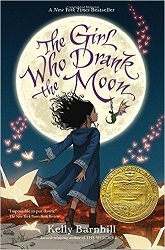 I went to the conference and was thrilled to attend the Newbery/Caldecott Awards Banquet. I got to hear Susan Patron give her acceptance speech for the Newbery Medal given to The Higher Power of Lucky. That was when it dawned on me that I was now a member of the group that awards the Newbery Medal! Was it possible I could become part of the award committee some day? Then I discovered School Library Journal’s Heavy Medal blog – with speculation each year about who will win the Newbery Medal for that year. When they posted the link to the Newbery committee manual, and I read every word, I knew this was something I should pursue. Not long after that, I learned about an invitational seminar to train ALSC members to serve on the media evaluation committees – like the Newbery committee. I applied – and was not accepted. But I kept on applying (the seminar only happens every other year), and the third time was the charm. I attended the Bill Morris Invitational Seminar on media evaluation in Dallas, Texas, in 2012. At the seminar, we heard from past chairpersons from various award committees. They gave us many pointers for serving on these committees and we got to enjoy some practice discussions. They also advised us to get involved in other ALSC committees and to put our name into the hat for award committee service. So in March 2012, I put my name in, and got on the ballot in April 2013 to be on the 2015 Newbery Committee! I was so excited! Then – I missed being elected by 15 votes! (Out of about 800 ballots cast.) It was already too late to get on the ballot for the following year, so I very sadly gave it a rest and worked on other ALSC committees. I served on ALSC’s Children and Technology Committee 2011 to 2013, followed by the Grants Administration Committee 2013 to 2015, and then was chair of the Grants Administration Committee for the 2015-16 year. I admit I was putting the time in to build my resume – and was pleasantly surprised by how much fun it was to help ALSC by working on these committees. I also became a member of Capitol Choices, a DC-area group of librarians and other children’s book folks who meet monthly and choose the 100 best children’s and young adult books of the year each year. Their discussion is great practice for the critical evaluation necessary in award committees, and there are several past members of award committees in the group. I was still publishing my website of book reviews, so I also applied for and got to be a Cybils judge. The Cybils Awards are Children’s and Young Adult Bloggers’ Literary Awards. I have served on panels for Middle Grade Science Fiction and Fantasy, Fiction Picture Books, and Young Adult Speculative Fiction. I’ve enjoyed the intense reading time – though this only lasts for two months, unlike the Newbery reading, which will last for a year. One of the things I learned from this work is that different people have different tastes, and other children’s literature professionals will appreciate things I didn’t see about certain books. But working together, we can make some great choices. When March 2016 rolled around, I decided I was ready to try again. I gave my name for consideration to be on the Newbery Award Committee ballot. This time, I made a web page with my qualifications and printed cards to pass out at ALA Midwinter Meeting and the ALSC Mini-Institute that happened a couple months before voting. This time I got the news on April 12, 2017 that I was indeed a member of the 2019 Newbery Award committee! I did have forms to sign and policies to agree to – mostly about secrecy. But as soon as publishers start publishing books for 2018, I am ready and excited to read and reread and to work with the other committee members to determine which is the most distinguished American children’s book published in 2018! Stay tuned in 2019 to find out what we choose! And if you read an American children’s book published in 2018 that you think is particularly distinguished – send word to Sondra Eklund at City of Fairfax Regional Library! You might have just helped discover the next Newbery Medal winner! Mary Fletcher’s official title is Creativity Specialist. She has been in charge of a program where they have brought the arts into the library. Arts are not crafts. Art is an open-ended process. Art has no planned product. Art is open-ended. Art has no adult sample to copy. Art can be spontaneous. A pre-planned craft can discourage creative choices. The presenters showed us many pictures from their Open Art Studio. I liked the image of a wall covered with buildings made of paper. No two buildings are exactly alike. Together, they form a wonderfully diverse town. Art is guided by the child’s choices. 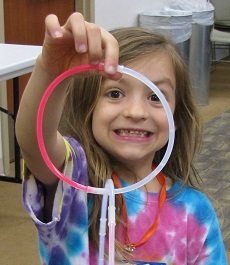 When children are fascinated, they make amazing things. We encourage exploration without imposing our ideas. When self-motivated, kids will persist despite difficulties. In their Open Art Studio, frustration is rare. They gain self-confidence and self-reliance. Creativity is intelligence having fun. In the future creativity will be needed more and more. Creative confidence hits a slump around 4th grade, when kids start wanting to conform. Creativity must be nurtured to survive. 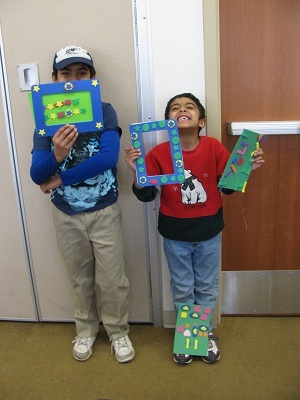 Open-ended art encourages imaginative play and storytelling. Scribbling is to writing as babbling is to speaking. With art, the library can support early writing as well as early reading. A table anywhere will work, even if you don’t have the budget for a dedicated space! The beauty of a library is that it’s not a school. They will learn, but it’s child-guided exploration. We can encourage imaginative tangents. Facilitators are intentionally quiet and unobtrusive. Facilitators get to serve at the banquet! They provide materials designed to encourage experimentation. 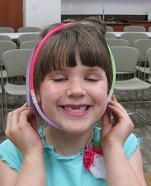 They also encourage art through movement, and have hosted three Family Dances at the library. They do a reading buddies program pairing teens with young children and spending a half-hour reading and a half-hour doing art together. The program inspired me. Though we may not be able to have an actual studio open all the time, it made me think about having more programs involving open-ended art. It’s been a long time since I’ve posted in my Librarians Help! series – but a program that happened this week was so awesome, I have to report it here. For years now, I’ve heard about Makerspaces in libraries and wondered if there’s a way we could bring that to our customers. At my level, a Youth Services Manager at a regional library in a system of twenty-two branches, there didn’t seem like a way I could bring this to my branch. How would we find space for equipment? How would we provide expertise? And how would customers pay for things like 3D prints? We already have a complicated system for regular print-outs. It just seemed beyond my resources to bring to our branch. However, libraries are about learning and creating! Our mission dovetails so nicely with the ideas of Makerspaces! And then I mentioned to a friend that my cousin is Mark Hatch, CEO of TechShop, a for-profit Makerspace. Shortly after his name came up, Mark’s Mom posted on Facebook that President Obama had recently toured the newly-opened TechShop location in DC/Arlington. Now that TechShop is in our neighborhood, I wondered if they think about doing outreach. Their mission is much the same as that of the library – about creating and learning. I contacted my cousin, and he put me in touch with the Education Coordinator at TechShop DC/Arlington. That such a position exists was a great sign. 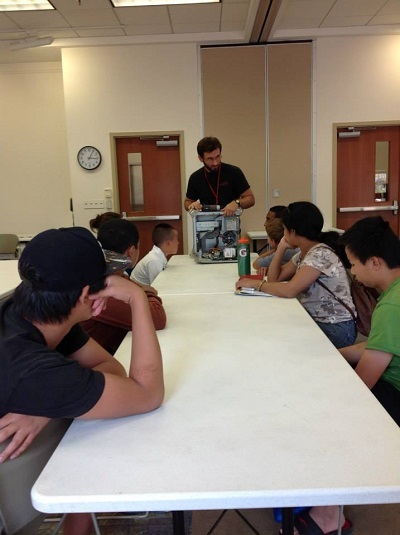 After some discussion, we set up three programs for teens at City of Fairfax Regional Library this summer! The partnership works wonderfully. TechShop provides the equipment and expertise. We provide the space and the publicity, reaching out to our neighborhood teens. 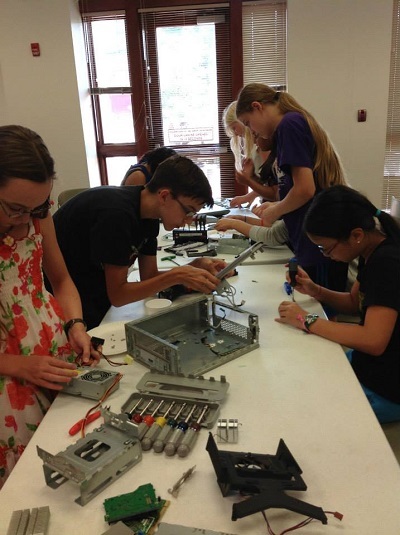 Our Friends of the Library pay TechShop’s fee (just like paying for puppet shows or other performers) and we are able to offer the programs free of charge to the teens who come. For the first program, TechShop brought in their vinyl cutter and the teens designed vinyl stickers and cut them out on the vinyl cutter. For the second program, TechShop brought two Sphero Robotic Balls. 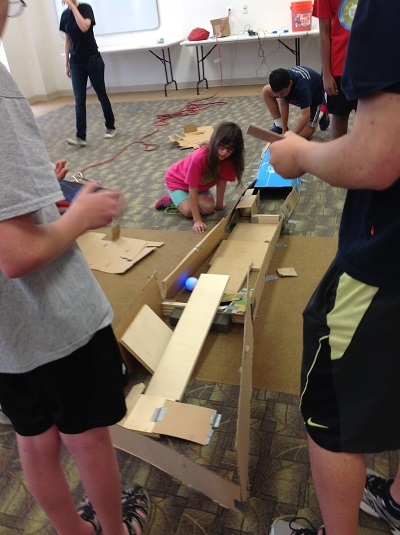 The teens got into two teams and created obstacle courses from cardboard which they then ran the robots through. The third program happened this week. TechShop brought in two old computers and lots of tools. Then the kids took apart the computers and learned about how they work. They got more and more engaged. I simply loved seeing them get better and better at figuring out how to take each next layer apart. They were having a fantastic time; they were feeling empowered; and they were discovering really cool stuff deep inside the computers! It was an awesome thing to watch! I’m hoping to do more programs with TechShop in the future. We’ve planned a 3D printing workshop in October, and I’d like to do another Computer Deconstruction program. Next summer, maybe we can plan some workshops at more branches. Now, I do always want to think through how I can improve the program. Next time, I’ll pull out more books on making and creating. (The library recently purchased my cousin’s book, The Maker Movement Manifesto, for example.) 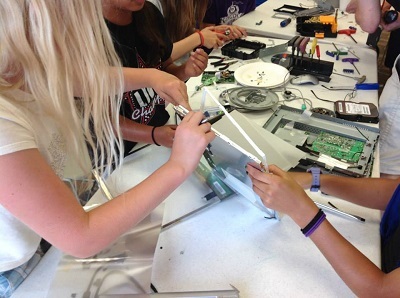 I think for the Deconstruction program, I’d like to bring in more craft materials, to give the teens more ideas of something to do with the computer parts they uncover. I think that other libraries out there that don’t feel quite ready to open a Makerspace of their own might think about this approach. 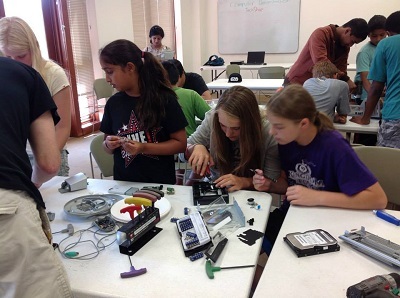 Is there a Makerspace in your neighborhood that might be able to bring programs to your library? It’s a natural partnership. Once again, as a Librarian, I got to help! 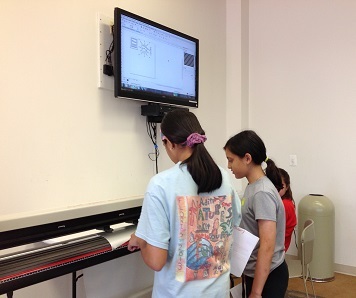 In this case, I got to help kids learn and create in exciting and engaging ways. 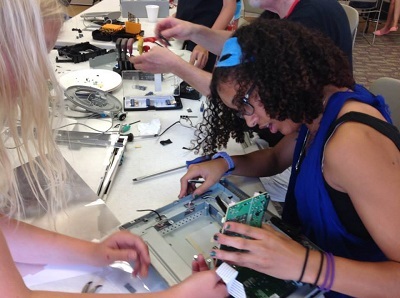 By working with TechShop, we were able to open teens’ minds to a world of possibilities. And we all had a lot of fun, as well! This week I brought my camera to Crazy 8s Math Club! We were learning about Sets and Venn Diagrams – and look at those faces! Crazy 8s is a Math Club sponsored by BedtimeMath.org. They provide the ideas and materials, and the library provides the place. Here is a set of kids with brown eyes. We had a Flat Visitor from California who also had brown eyes! 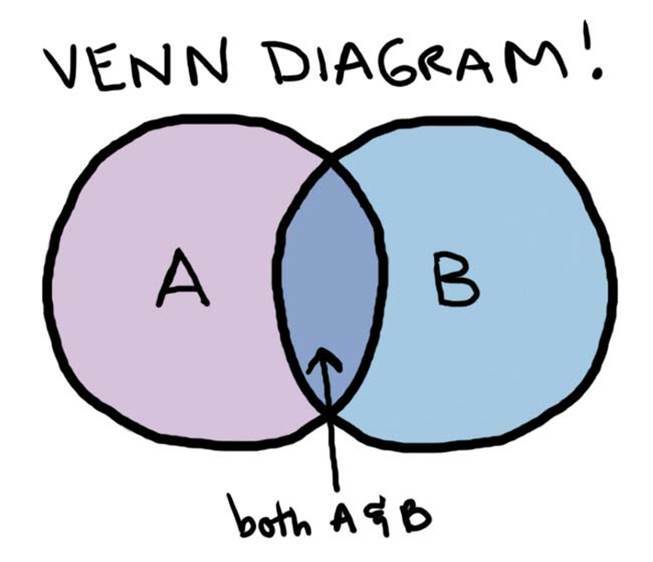 When we started the 3-set Venn diagram, I thought they could start with cars and trucks. They caught on quickly! 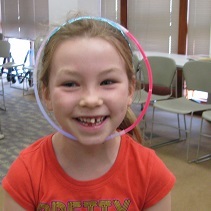 And afterward — some silliness with the glowsticks (which they got to take home). More proof that Math is Fun — and kids know it! 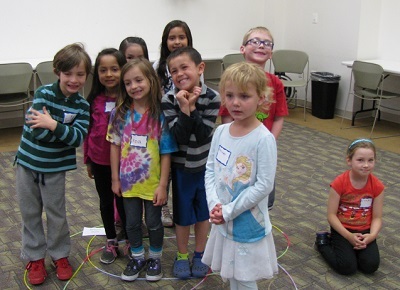 This last Saturday I got to do an Every Child Ready to Read Workshop (sponsored by the Association for Library Service to Children and the Public Library Association), but I confess I made some changes. The workshop, as prepared, was “Fun with Science and Math for Parents and Preschoolers.” The workshop I did? Well, I confess I left out the science and added lots of math activities. Some friends on my Facebook page asked for details, and I thought it might be helpful for other librarians to know the adjustments I made. So I’ll just give the basic outline of the program. Imagine nice slides that came with the Every Child Ready to Read workshop. As they came in, I gave every parent-child group a piece of paper and a box of crayons. I told them to write their child’s name in large letters so everyone could see. Some parents did this and some had their children do it. I let them keep the crayons and paper just in case the kids got restless during the talking-to-the-parents part. What follows is a bit of an intro about Every Child Ready to Read. To warm up the audience, I mix it up by reading a book, and this time I chose Let’s Count Goats, with words by Mem Fox, and goats by Jan Thomas. But the meat of ECRR2 is the five easy practices. These five easy practices, done often with your child, will help your child get ready to learn to read when they start school. What’s more, they’re fun. What’s more, they are also practices that will help your child learn math concepts. The beauty of them is that they use teachable moments and can be tailored to fit your child’s level. The five easy practices are Talking, Singing, Reading, Writing, and Playing. I have a lot of material on Talking about math as you go through your day. How many cars are going by? When riding in the car you can extend this by counting cars you pass and subtracting cars that pass you. How many jelly beans do you want? After that question, I talk about how when my boys were little, before they had much of a numerical concept, I’d ask them how many candies they wanted. They learn quickly that way! This is a great lead in to reading the book How Many Jelly Beans? By Andrea Menotti and Yancey Labat. Also under Talking about math, I mention that counting, measuring, sorting, and comparing are all math activities. I pass out a handful of foam shapes to each family and tell them to decide how to sort them. They usually choose by either color or shape. They help the child sort them. Then they should count how many shapes in each group and write down the numbers. The families did great with this. On the third slide for Talking, I have a link to www.bedtimemath.org, and this time I was able to bring their new book for checkout! We read an example problem from the website. I talked about how I did this with my own younger son. The magic words that my son learned could extend bedtime forever were “Just one more math problem, Mommy, please!” I could not resist that plea! And bedtime, which is indeed a lovely time for reading to your child, is also a cozy time for talking with your child. The problems on bedtimemath.org and in their book are nice problems you can talk about a little bit and work out an answer together. They come at three different levels, so you don’t have to stop when your child is small. The next of the five easy practices is Singing. Singing slows down language, so it helps kids learn the sounds in words. It also helps them learn numbers by putting them to music. At this point, we sing “Ten Little Beasties” (same tune as Ten Little Indians), first clapping with each number, and then trying to hold up the number of fingers as we sing. Then we do “Five Little Monkeys Jumping on the Bed” with motions. The centerpiece of the five easy practices, the most obvious one, is Reading. Of course reading to your child will help them get ready to read! But did you know it will also help them get ready for math? I bring a cart full of books with mathematical concepts to the program. And at this point I read one of them. I like to use Quack and Count, by Keith Baker, because it also introduces the concept of addition, and it’s a fun story. The group this week spontaneously added a “Quack, Quack!” at the end of every page. The fourth of the five easy practices is writing. Here I talk about all the reasons to write numbers in life. Any time you write a list, you’re modeling this. Even if you don’t use numbers, if you write your grocery list in groups, that’s still a mathematical skill of sorting. For a little activity here, I ask the parents to help the children count how many letters are in their name and write down the number on the paper next to their name. The fifth of the five easy practices is playing. For reading, dramatic play is so good. For math, I use this opportunity to put in a plug for board games. Candyland’s a great start, and you can’t beat Monopoly Jr for beginning addition and counting. But playing is also at a much less formal level. Any measuring, counting, sorting, and comparing can be playing. At this point, we have all the families get in line in order of the number of letters in the children’s names from the front of the room to the back. This time, we went from BJ to Alexandra. 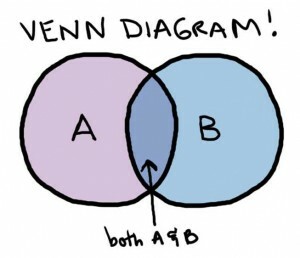 For another playing activity, we did a Venn diagram. I brought in a bucket of cars and trucks. I put two yarn circles on the floor. One circle was for red things. One circle was for cars. I put them on the ground so they overlapped. We figured out together where the different objects went. (“Is it red? Is it a car?”) I definitely should have used red yarn for the “red things” circle. But the kids had fun with it, anyway. On another “Playing” slide, when it works, I show this clip from the Fred Rogers center. This time, for some reason the link wouldn’t work. But it shows a family making beaded bracelets and necklaces using repeating patterns. Then we get the same idea reading the book Pattern Fish, by Trudy Harris. So there you have it! Some simple ways to incorporate Talking, Singing, Reading, Writing, and Playing… about Math! I’ve done this program twice, and we’ve had a lot of fun both times. The parents get lots of ideas, and we all have fun together. It does run long, a whole hour, but the kids stay engaged, so I must be doing something right. Any ideas and tips you have from using the Every Child Ready to Read Workshops? Or just ideas for Talking, Singing, Reading, Writing, and Playing about Math with Preschoolers? 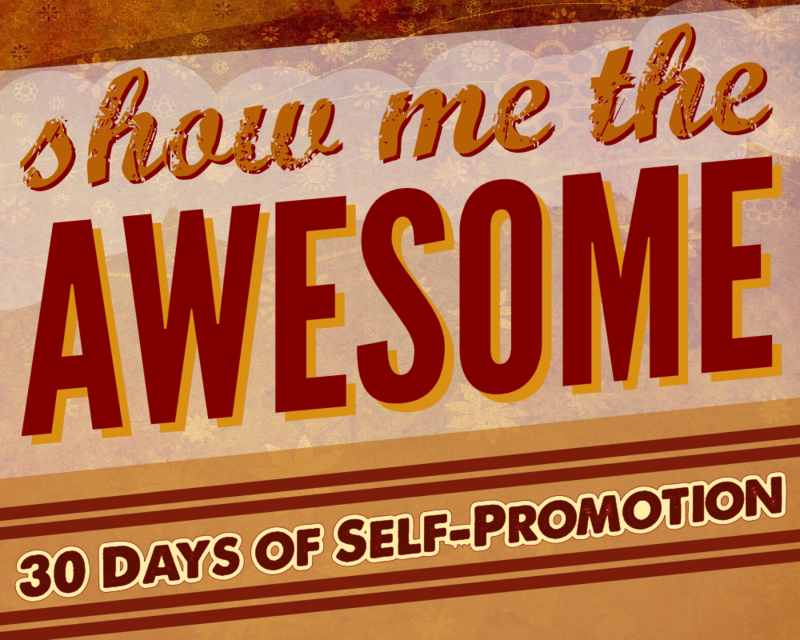 This month I’m excited about Show Me the Awesome: 30 Days of Self-Promotion, hosted by Liz Burns, Kelly Jensen, and Sophie Brookover. The Awesome artwork is by John LeMasney. The idea is wonderful: Librarians talking about the awesome things they are doing. Now, I’ve long believed that Librarians, as a whole, are tremendously undervalued. I have a sporadic series on my blog I call Librarians Help, trying to spread the word about the good we do. Read all the 30 Days of Awesome posts! If you’re a librarian yourself, you’ll get some great ideas. 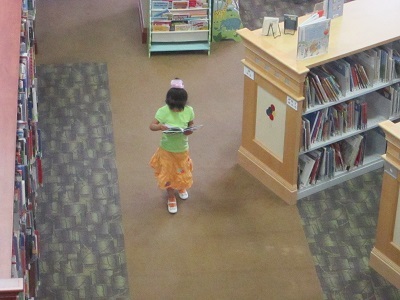 If you’re not, you’ll learn about some truly awesome things librarians are doing. I also signed up before booktalking season began. Today, for the first time in four years, I went to a local elementary school and talked with all seven grade levels about our Summer Reading Program and whet their appetites for some of my favorite books. I remembered how exhausting it is, but I had forgotten just how awesome it is to see all their faces listening to you tell about the books, and getting feedback that they are now determined to read some of the books you shared. I took a nap when I got home tonight, but I’m in a great mood. Getting kids excited about reading is such a mood booster! But for my Awesome post, I already had in mind something I wanted to talk about: Math in the Library. Before I got my MLS, my first Master’s degree was in Math. I taught college-level math for 10 years. And though I love math, the teaching job never felt like a calling, the way librarianship does. Part of what I love about the library? We don’t have to test anyone! No, at the library, we’re all about learning, and we assist learning for people who want to learn. What’s more, I’ve always believed there’s no need whatsoever to “make” Math fun. Math *IS* fun! And we get to show that to kids! 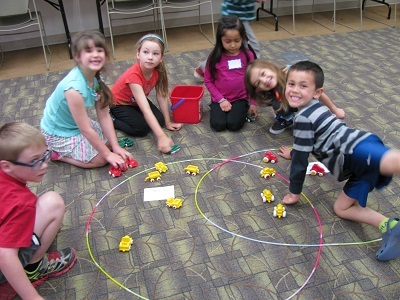 So, what are some awesome ways recently I’ve gotten to show people how much fun Math is at the library? Fresh in my mind, this morning I booktalked You Can Count on Monsters, by Richard Evan Schwartz, Great Estimations, by Bruce Goldstone, and Just a Second, by Steve Jenkins. But let me tell you about some programs. We did have fun! We emphasized the practices parents can use to build a foundation for reading in their children: Talking, Singing, Reading, Writing, and Playing. And we talked about how you can apply those things to Math as well. I outlined some things I did in an earlier post. I am hoping that some of these parents are all the more eager to count with their children as they go about their days, to talk about math, and to play games with their kids. I made sure to introduce them to bedtimemath.org, and I hope some of the parents are starting a bedtime tradition of math problems at bedtime. See how we can take a totally different focus than a teacher has to in the classroom? I can give the parents ideas of ways to have fun, and they can choose the ones they go with. (For example, when picking up toys, ask your kids how many toys they think are on the floor? Count as you pick them up, and it will go faster!) Did you know that setting the table or matching socks are early math activities? My other Awesome Math program that I’m excited about is called Colors and Codes. In this program, I show the kids my crazy Prime Factorization knitting projects and Prime Factorization t-shirt, to give them the idea that you can use colors to represent numbers. Then, if you use numbers 1 to 26 for the letters A to Z, you can use colors to represent letters. Which means that colors can be used to write messages. I start with showing them prime factorization color codes and move on to other bases. Base 6 and Base 5 work well for the 26 letters, but I also show them Binary (Base 2). I show them they can also use shapes. With binary, they can use practically anything: sounds, lights, dots & dashes…. Then I have lots of foam shapes available, and let them make craft projects. They can devise their own codes using these ideas and decide what they want to say. 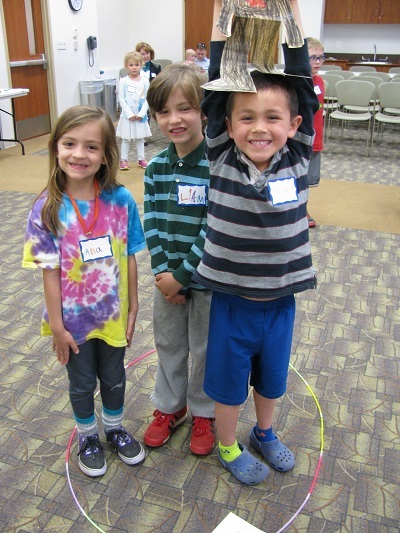 Oh, and one more low-key but totally fun program I do at our branch is “Brain Games at the Library.” Playing games builds logic skills and mathematical thinking. But see how there’s no pressure, no testing, and only fun? For the Brain Games program, we give them gently used books as prizes. It’s fun to watch the kids thinking they’re getting away with something when they take a pile of books home from their wins! All this is to say that I’m so happy I still get to teach Math! Only now I get to show people how much fun it is! Librarians Help! Showing how Awesome Math is! 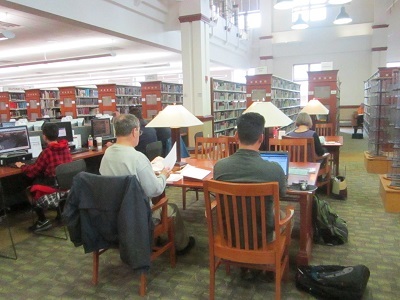 Yesterday was Library Snapshot Day in Virginia. Later, when they’ve compiled the data, they’ll post statistics like how many people were served. 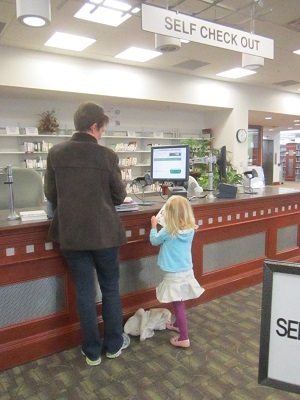 Last year, for example, 412,969 items were checked out from Virginia libraries in just one day. We had a busy day, since of course it was tax day. On top of that, the kids in the public schools were off for the day for a teacher work day. We had a Puppet Workshop that was well-attended. Kids got to use art supplies to make puppets and then try out our puppet theater. My co-worker Jackie Butler was the one who cleverly took these lovely pictures that didn’t show anyone’s face. Those who think libraries are dying or aren’t necessary to the community need to take a look at a typical day! Yesterday, I also learned that ALA’s “The State of America’s Libraries 2013” has been published and is available on the internet. Click through! It’s fascinating! Again, libraries are alive and well and thriving. And librarians are still a valuable part of libraries. 53% of the Americans surveyed in this research project used a library in the last year, and 50% of those asked a librarian for help. I told you! Librarians Help! 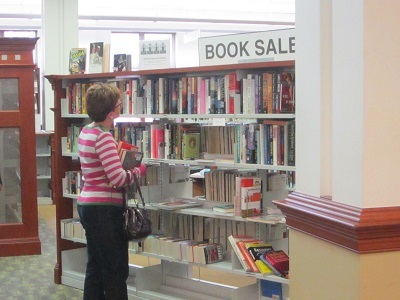 And finally, I read a wonderful post by author Jo Knowles about why libraries are important. Who has a personal stake in the survival of libraries? We all do. Librarians Help! – More Math! This was a crazy week for me for programs. I don’t know what I was thinking (Well, besides the fact that it was Spring Break), but I scheduled a program every day I worked this week except Monday. What’s more, two of them were programs I was creating and had to figure out what I was going to do and say ahead of time. So, let’s just say I was a little stressed. And it went great! The week is done! I can relax and enjoy Easter! And my month of April only has a few programs, so I can even focus my energies on moving. But I want to talk about today’s program, because it was cool that I got to do it, and super that it actually worked. It was an Every Child Ready to Read workshop. The workshop as prepared by the Every Child Ready to Read folks was called “Fun with Science and Math for Parents and Children.” Okay, I changed it. I called it “Fun with Math for Parents and Children.” (Because Math is more fun than Science! Don’t tell!) Of course, that meant I had to fill in with more math activities. But that was fun to do! All of the Every Child Ready to Read workshops focus on five easy practices for parents to do with their children — Talking, Singing, Reading, Writing, and Playing. Not only are those activities good for learning pre-reading skills, they’re also good for learning early math concepts. We did some counting together; the parents did some counting with the kids. I read them How Many Jelly Beans?, Quack and Count and Pattern Fish. (All of the books I read got checked out after the program, too.) I passed out some foam shapes and the parents and kids sorted and counted them. I also passed around a small tub of shapes, and they all guessed how many. Then we counted them together — there were 77. We counted how many letters in each child’s name and then lined up in order of the number of letters. We sang “Ten Little Beasties” and “Five Little Monkeys Jumping on the Bed.” I showed them the awesome site that is BedtimeMath.org. And they finished up by making their own little counting book with a foam cover and paper inside. They could decorate it with shapes in patterns, or just with pretty shapes. The comment that really made me happy was the mother who said she “learned a lot.” Another mother said it was so nice to have a program a little different from a storytime. Yet another said she thought the balance between activities and talking was just right. That one brought me a big sigh of relief! I had worried about whether the kids would be able to tolerate all I was going to say to the adults. But it worked! It really worked! My plans are to do another Every Child Ready to Read workshop next month — this time “Fun with Letters for Parents and Children.” Then I’ll take a break until after the Summer Reading Program and do more next Fall. But our first one was a big success! And I’m especially happy that a group of parents will think of the library when they think of their children getting ready for school and ready to learn to read. And ready to do Math! You are currently browsing the archives for the Librarians Help category.